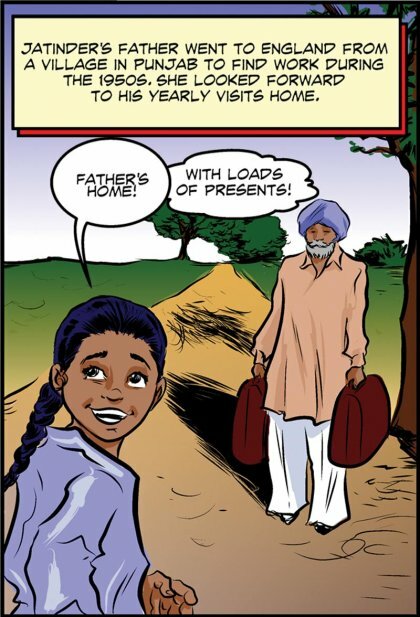 Jatinder's father went to England from a Village in Punjab to find work during the 1950's. She looked forward to his yearly visits home. Jatinder: " Fathers home! - With loads of presents!". When she was 15 and about to begin her final year in high school the family joined him in England. She was excited but also sad at the thought of leaving all her friends behind. Life in the UK was very different from what she was used to. 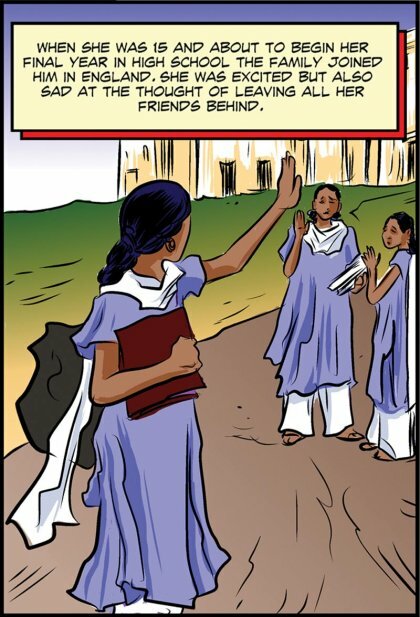 Soon after she came, Jatinder began working at a petrol station. Jatinder:"I really want to go back to school". When she was 23, she got marries to Raj, who was also a recent migrant from Punjab. They moved to Southall, in West London, where they rented a room in a house. 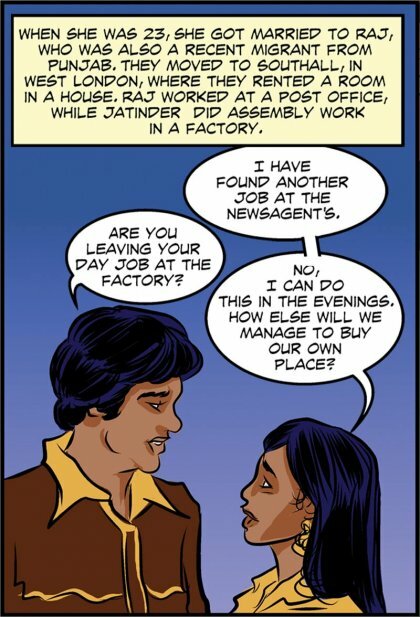 Raj worked at a post office, while Jatinder did assembly work in a factory. Jatinder " I have found another job at the newsagents" Raj - "Are you leaving your day job at the factory? Jatinder "No, I can do this in the evenings. How else will we manage to buy our own place? 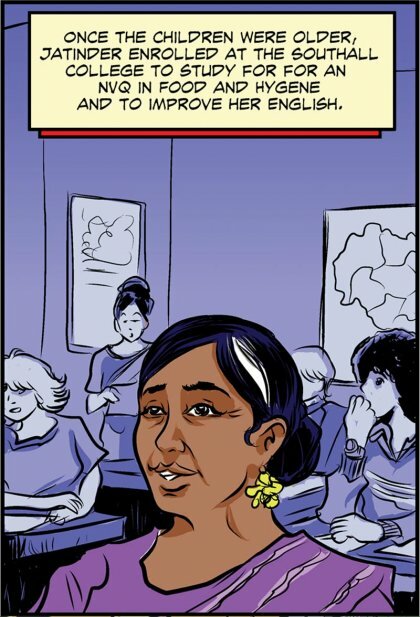 A year after her marriage, Jatinder found that she was pregnant. Jatinder "I will need to take some time off. I am going to have a baby." Boss "Sure, but dont bother to come back. I will find someone else." 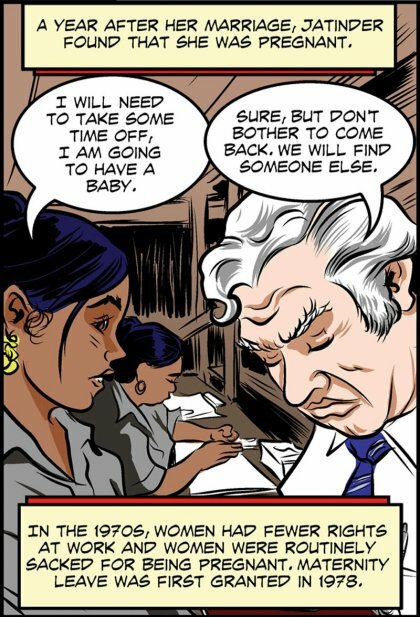 In the 1970's, women had fewer rights at work and women were routinely sacked for being pregnant. Maternity leave was first granted in 1978. 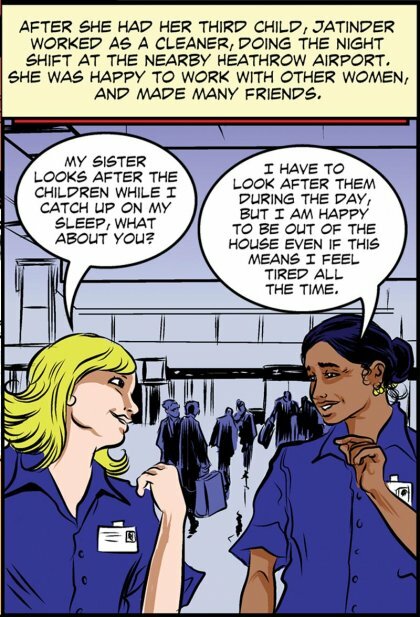 After she had her third child, Jatinder worked as a cleaner, doing the night shift at the nearby Heathrow airport. She was happy to work with other women, and made many friends. Women Worker "My sister looks after the children while i catch up on my sleep, what about you?" Jatinder " I have to look after them during the day, but i am happy to be out of the house even in this means i feel tired all the time." Once the children were older Jatinder enrolled at the Southall college to study for an NVQ in food and hygiene and to improve her English. Jatinder soon found a full time job at Hillingdon hospital, cleaning and serving meals to the patients. She joined the trade union, UNISON. The following year, in 1994, Hillingdon hospital contracted out the cleaning services to a company called Pall Mall cleaning. 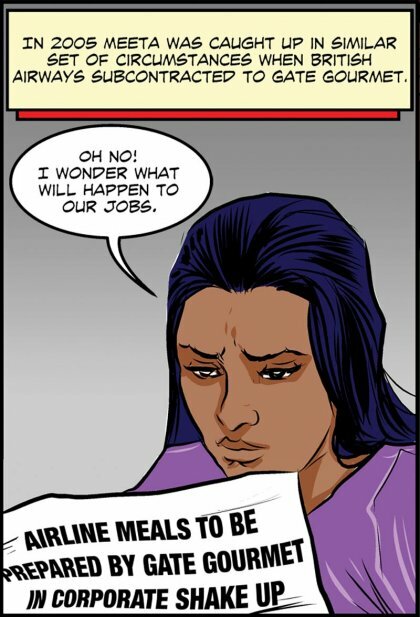 Woman worker "Have you heard the news? 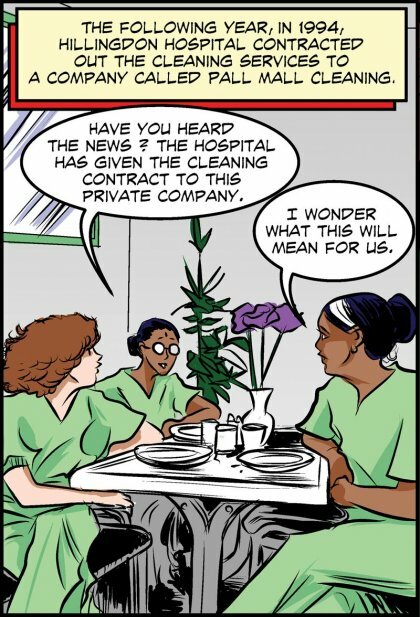 The hospital has given the cleaning contract to this private company. Jatinder "I wonder what this will mean for us?" In October 1995. Pall Mall cleaning made an announcement. Employer " You have 90 days to sign the new terms and conditions." 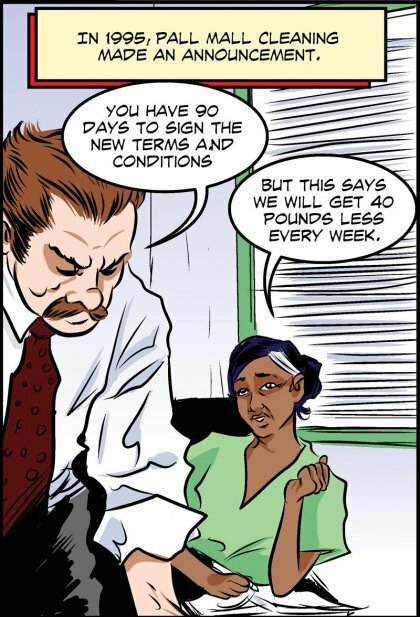 Jatinder "But this says we will get 40 pounds less every week." The 90 day deadline was upon them. But of the 61 cleaners, only 6 had signed the agreement. Woman worker "Have you signed the agreement?" Jatinder "No, it is just not fair, have you? 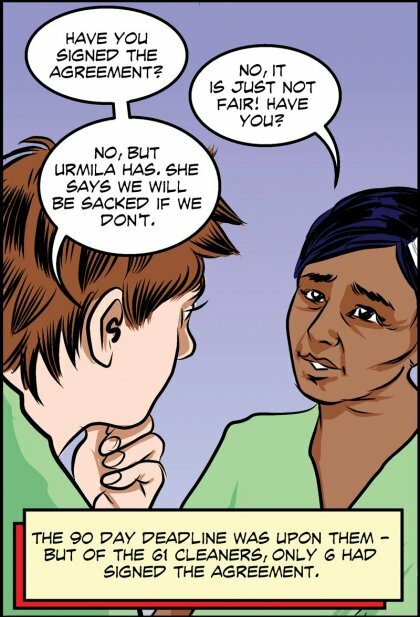 Women Worker " No, but Urmila has. She says we will be sacked if we don't." 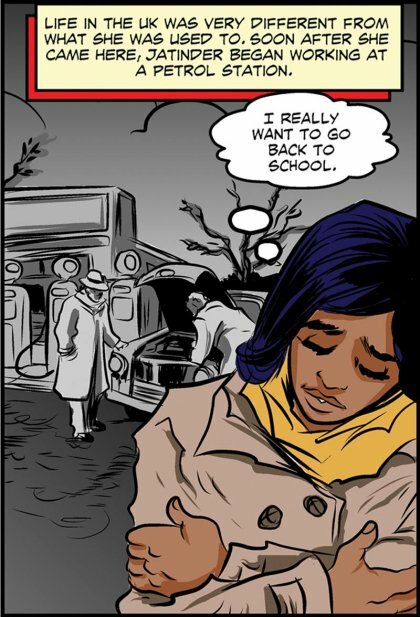 On the 90th day it was Jatinder's day off, but she went to work to see what was going to happen. Woman worker "Lets show them what we think!" Jatinder "Yes!" 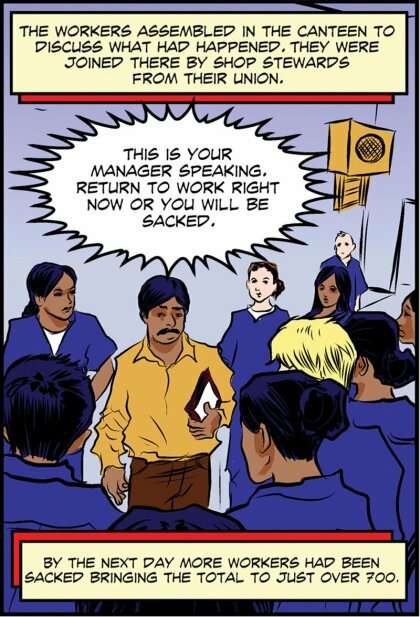 That night, the company sent a letter of dismissal to all the 55 workers. Their union, UNISON, initially supported them, but the workers refused to accept the agreement unison negotiated with the company. They took their case for unfair dismissal to an employment tribunal. 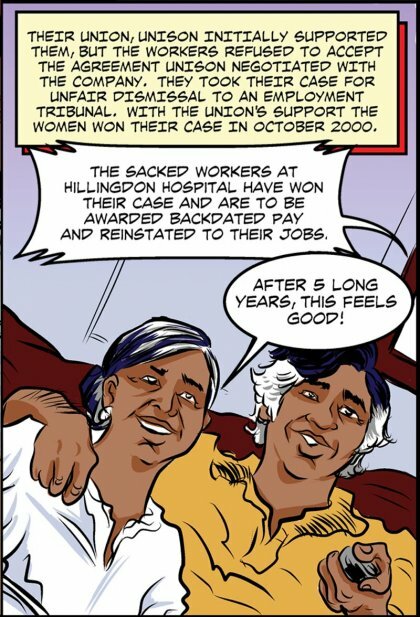 With the unions support the women won their case in October 2000. Radio "The sacked workers at Hillingdon have won their case and are to be awarded backdated pay and reinstated to their jobs." Jatinder "After 5 long years, this feels good!" 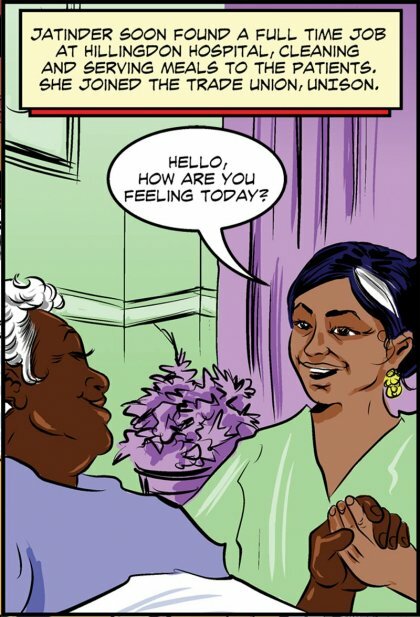 Today, though past the official retirement age, Jatinder works part0time and looks after her Grand-Daughter while her daughter, Meeta works ar a company that prepares meals for airlines, Gate Gourmet. 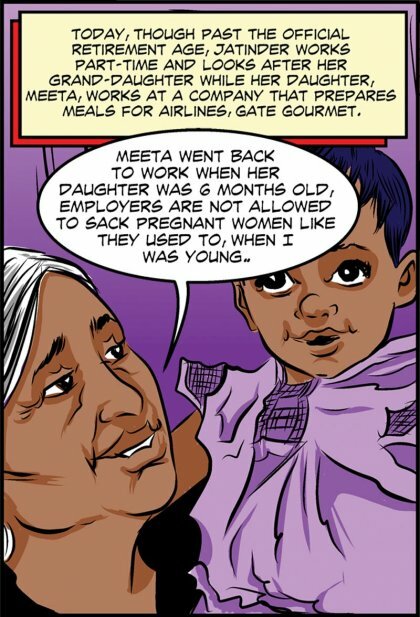 Jatinder "Metta went back to work when her daughter was 6 months old, employers are not allowed to sack pregnant women like they used to, when i was younger." Gradually, the company started making changes to the terms and conditions for the workers and the management became increasingly harsh. The workers resisted the changes. Employer "Lets try increasing the speed of the conveyer belt. 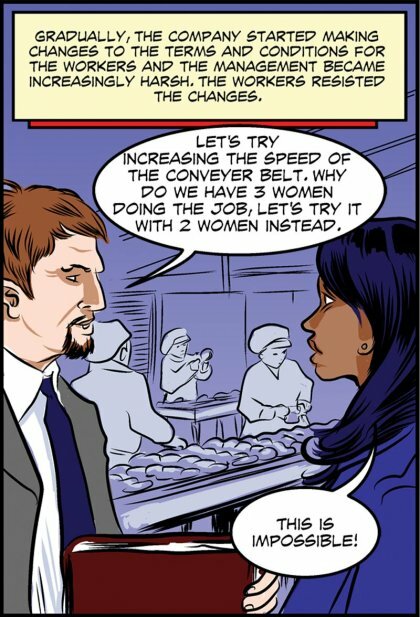 Why do we have 3 women doing the job, lets try it with 2 women instead." Meeta "This is impossible!" 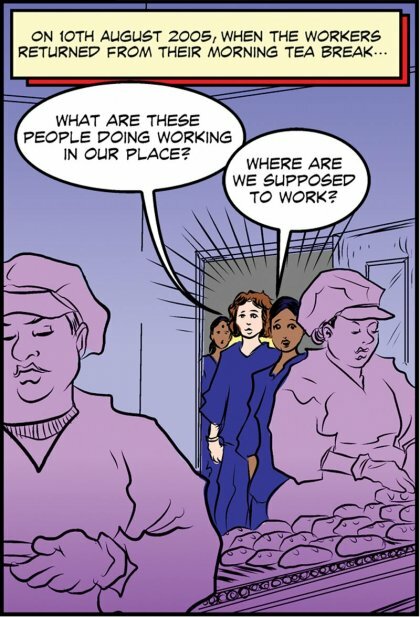 On 10th August 2005, when the workers returned from their morning tea break... Woman worker "What are these people doing working in our place?" Meeta "Where are we supposed to work?" The workers assembled in the canteen to discuss what had happened. They were joined there by shop stewards from their union. Public address system "This is your manager speaking, return to work right now or you will be sacked." By the next day more workers had been sacked bringing the total to just over 700. Meeta "The union has reached an agreement with Gate Gourmet - But not all of us will get our jobs back!" 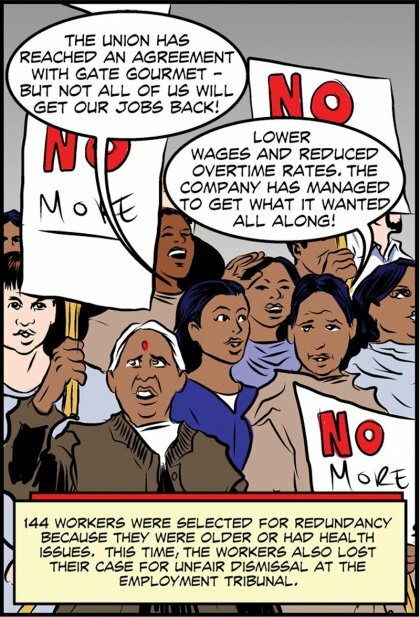 Woman striker "Lower wages and reduced overtime rates. The company has managed to get what it wanted all along!" 144 workers were selected for redundancy because they were older or had health issues. This time, the workers also lost their case for unfair dismissal at the employment tribunal. Jatinder "I always thought that all the struggles of my generation would mean that life would be easier for you. Meeta "Don't worry mum, some things have got better! 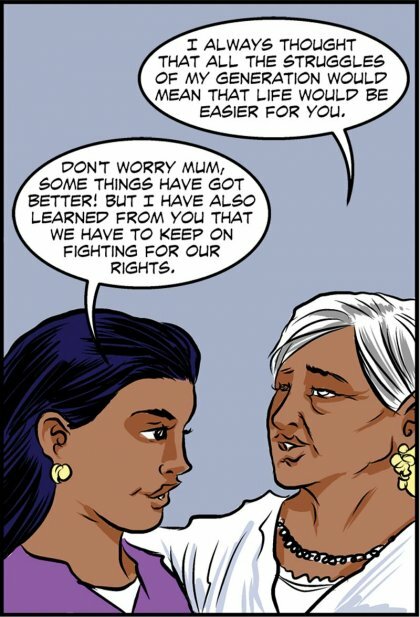 But I have also learned from you that we have to keep on fighting for our rights.